Waltzing Matilda: Pink or blue... it's a cupcake for you! Pink or blue... it's a cupcake for you! I did not mean for all that to rhyme. Everybody is thrilled! 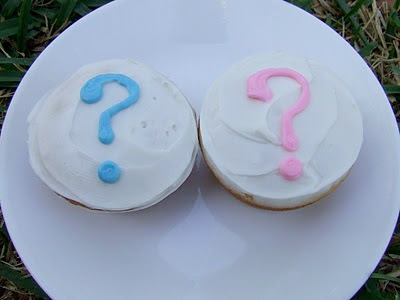 Of course, we would have been thrilled with a boy or a girl. We are mostly thrilled that she looks healthy! We started the morning off with a session of "what's so wonderful about baby boys and girls" hoping to stem the tide of any disappointment that might be felt later. Everyone had to answer and it was so sweet to hear what the girls thought would be exciting about a baby brother and what the boys thought they could help a baby sister learn. Sunshine said she could teach a brother how to knit because boys were the first knitters. Shortcake thought she could teach a brother all about Rangers as the Ranger's Apprentice adventure series is one of her favorites (she's an adventurous kind of girl). The Professor contemplated the girlie LEGO sets he's seen and thought he could help a little sister discover this wonderful world, the same as he's done for his two sisters already. And BigBoy realized that it's just as easy to make a baby sister laugh and giggle as a baby brother and he is definitely looking forward to that "chore". Thank you for all the prayers, friends! The cupcakes are so clever! Congrats! Congratulations! What wonderful, pink news!!! I love that you shared this. I will always cherish my memories of my older children being excited about a new baby, and now I wish I had been clever enough to do something so cute and fun. God bless your sweet family! Awesome news! So happy for you. Of course, we would have been thrilled with a boy or a girl. We are mostly thrilled that she looks healthy! I'm so happy for you, Charlotte! Tickled pink!! I have a serious cupcake craving now, however. A precious idea. Congratulations and I love your idea of the cupcakes. You already know how excited I am for you!!!!!!! What a great post! I love the rollover. :) Thank you for sharing your news. God bless you all! Congratulations! I love how you discussed what would be fun about having either a little brother or sister with the kids. I think that's a great tactic to avoid sibling disappointment. Your cupcake idea was great, too. I may have to use that! What a cute way to tell them! Congratulations, again. Congratulations, Charlotte! I am so happy for you! God's blessings throughout the rest of your pregnancy. cograts. what a joy. I LOVE this post. Congratulations!!! I am so so so so excited for you! I love this. What a creative and delicious way to share your news. Congratulations again! We chose to not find out during our ultrasound, but we're assuming we'll be adding more X chromosomes to our Estroden. Congratulations! We love following your news and can't wait to hear more about your little girl! Congratulations! Loved what you did with the rollover. Wish I was that talented. We will keep the prayers coming for you and your little girl. Awesome!!! I can't wait to tell my girls. Hooray and Congratulations! So glad to know all is well. Sugar & spice are awfully nice, aren't they? And yet...we love those puppy dog tails, too! What a sweet (literally) post, dear friend, and what happy news. A healthy baby! A baby girl! Pink! Yeah Pink! Congratulations on your lovely news. Pink is such a lovely color...congratulations!! Wow, Charlotte! Either way would have been wonderful -- but now you can be thinking happy Momma thoughts in pink and eyelette! Congratulations! I teared up from this blog. How adorable. I am expecting - could go into labor any day now. It is a girl also. Congratulations!